This week's blog was written by Marcia. It’s been odd this last few days having breakfast without the group of friends that have been my companions for the last year. They didn’t all arrive together: one or two to begin with, then a few more showed up and – only a month or so ago – a late arrival, very exciting – who had to be introduced to the others, adjustments made, fresh ideas explored. And all the while it was high summer in a secret valley at the edge of the moor. Quite a shock then, to find them gone, the kitchen empty, and the ash trees still in very tight black bud. While I was living in my parallel universe – watching the swallows, smelling new cut hay and honeysuckle, listening to skylarks – the winter has loosened its grip a little, tulips are opening in the garden, and the crab-apple tree is in blossom. Sun pours in through the skylight window while I eat my breakfast and there is clear blue sky beyond Brent Hill. I miss my friends: I miss wondering about them, listening to scraps of conversations, making connections. I see them in their own kitchens, in their cars, shopping, sailing. I eavesdrop on them, snoop around their houses, study their gardens, get to know their dogs. They can’t get away from me – and I can’t get away from them! There is a degree of relief once their stories are told and they begin to disappear back into their separate world. I don’t let them go too quickly and I spend considerable time wondering if I’ve listened properly, done them justice. Sometimes my agent or my editor will ask for more information and then I need to re-visit them, to listen again for something I might have missed that could be expanded. They never quite disappear, of course. On Wednesday I drove across Dartmoor to Gunnislake to take an old friend down to Cotehele for lunch. As I stood on the banks of the Tamar, watching the tide rolling in across the mudflats, I was aware of Johnny and Sophie and Oliver just around the bend in the river and, driving back through Tavistock, I think I saw Kate hurrying into The Bedford. 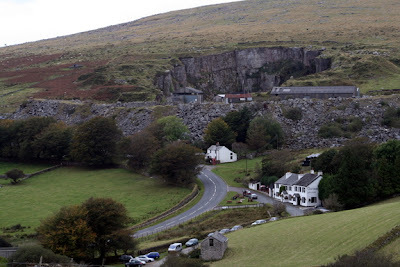 The quarry at Merrivale on Dartmoor. There was thick fog on the moor and I drove slowly, thinking of Polly up behind Merrivale, and of Frances setting out for Ashburton in the snow. I passed Foxhole and raised a hand to Brigid; stopped to revel at the sight of the wood anemones in Hembury woods that Louise saw on her way to Foxhole from the station. And, even as I’m writing this, another old friend is standing at my shoulder, trying to grab my attention. She’s been around for a few books now but each time other characters and their stories have been more vociferous, clearer to me. She’s moved in very close this time, though, and I think I’m going to have to let her tell me her story; what she’s been doing since I saw her last. I shall meet her new family and her friends and discover the connections that link them together. I was going to have a break; do all those really crucial things that have been put on hold: gardening; cleaning out cupboards; writing letters. Instead I’ll jut have to make some coffee, sit in the sunshine on the balcony all amongst the crab-apple blossom, and start listening. Gosh, it’s hell, being a writer. This week's blog dog is known as Skye. As you all know, it is some time since Marcia set a book on Dartmoor. There were, I think, three reasons for this. When she started to have the ideas that were to result in The Children's Hour, she had a specific feel for the book's landscape. This is not unusual but there was nowhere on the south coast, the coast we both knew very well, that fitted – nor did the small part of the north Cornwall coast that had been home. 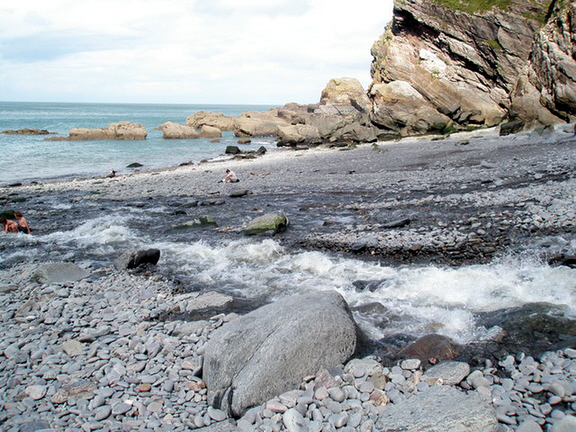 Beaches and cliffs: typical of the north Cornwall coast. We lived for a while at a place called Polrunny just to the south of Boscastle. The house was a thousand feet above sea level and my study was high up on the second floor (for the sake of readers outside the UK, I should explain that here we have a ground floor, at ground level, and go upstairs to a first floor and up again to the second floor). The window faced north and from my desk I had a wonderful view of Lundy Island, but only when the weather was clear. It rains lot in that area and, as was explained to us when we moved in, "If you can't see Lundy, 'tis rainin'. If you can see Lundy, 'twill be rainin' soon." They were, of course, quite right. Not Lundy but Gull Rock near Padstow but you get the idea. It is the only study in which I have felt sea sick. Since I am rarely sick when at sea this was unexpected. There had to be an explanation but it was some time before the penny dropped. The carpet was a dark brown on fawn dog tooth design. When the wind blew hard, this would lift slightly with each gust and it was this pattern lifting and falling against the unmoving hard edge of my desk that was making me feel odd. A few carpet tacks provided a complete – if inelegant – cure to the problem thus proving the hypothesis. I digress: we were looking for a home for those children living in Marcia’s head at that time. 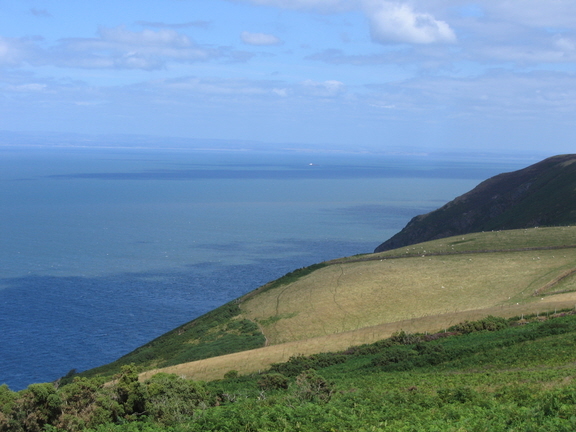 After trekking down further into Cornwall without success we set off to explore the north coast of Devon where the Bristol Channel meets the Irish Sea. After a few false starts we found what she was looking for. We were to the west of the hamlet of Trentishoe, just inside the Exmoor National Park, in an area completely new to both of us. Marcia had visited the eastern parts of the moor as a child – I knew nothing about it at all. The next few years were devoted to exploring it, photographing it, loving it and writing about it. This was the first reason – pastures new. The second was that Marcia felt she had written so much about Dartmoor that she was getting stale. It is impossible to know whether or not that fear was justified as the next few books were to be set elsewhere. Then we moved – the third reason. The Hermitage is a lovely house set in the middle of what the government described as, "one of the two remaining truly rural sinks of tranquillity in the country." I would not argue with that. We were in the largest postal area in England – and the one with the lowest population. If three vehicles passed us before lunch time it was surprising. At night we could see only one light: shining onto the yard of a farm some miles up the valley. Surrounded by a multitude of nesting habitats for birds in an area which was short of suitable food for them, we built up the most amazing local populations and became a regular restaurant for sparrow hawks. This delighted us: the presence of a top predator indicates a thriving ecosystem. There were, of course, downsides. It was round trip of twenty-four miles to the nearest sensible shopping centre and fourteen to the village with a post office store, a farm shop and the doctor. And it was a long way from Dartmoor. Having said that, access to Bodmin moor was quite easy. So it was that the books written in the next few years were to be set on either Exmoor or Bodmin. Then, one day last summer, we decided the time had come to return home and so we did. Despite our passion for Exmoor and despite our flirtation with Bodmin, Dartmoor is home. It is as if we have had a mid-life crisis and have spent a few years fooling about with a couple of wonderful mistresses and now we have returned to an adored, patient, understanding and totally fulfilling wife. This week's blog dog is Billy, waiting patiently outside the newsagent. You were all pretty close with your answers to last week's silly photo but it took an email from a reader to get the answer spot on: A Balwen Welsh mountain sheep. These used to live in the small Tywi Valley and they were very nearly all killed by the severe winter of 1947 (so was I - I was at a freezing prep school at the time - we built a snowman the remains of which were still there at the start of the Easter holidays). Some say that there was only one ram left alive. So it is hardly surprising that the reader who emailed Marcia lives on a farm in Wales, is it? Please don't ask me what this one is doing on a Dartmoor farm with a Whiteface as a friend. Cast your mind back to The Prodigal Wife and the coastguard cottage in which Cordelia lived and worked. 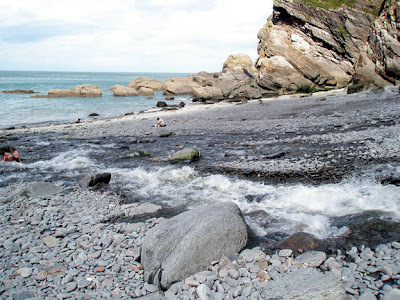 This was set somewhere on the Devon coast within reach of both Kingsbridge and Dartmouth. Not so the cottage from whence came the inspiration for this dwelling. Last Saturday and the weather was iffy – slightly better than forecast being bright but still cold. As some of the writers of the Georgian period would have put it: cold and cold. Marcia’s mobile beeped. It was a text from one of Marcia’s great friends, Anne. Lovely idea. Especially as it is Anne who lives in the old coastguard cottage – albeit down in Cornwall – referred to above. I have been meaning to let you see some reasonable pictures of the views that Anne enjoys but the last few trips down there have been in the rain or when the bay was home to a heavy mist. Not so last Saturday as the following will show. You really can’t blame Anne for wanting to live there, can you? As we approached Anne's cottage, there was a man paragliding over our heads. If you look very carefully you can just see him hanging in the sky straight up from the road. As I remarked, it was cold and cold but bright. For the first time it was possible to sit outside but only if well protected from that cold and, in Marcia's case, from the glare. While we were there I shot some video. I won't bore you with much but this gives you some idea of the view from Anne's terrace. We were about to leave when a drilling rig being towed down the channel by two tugs came into sight around Rame Head. Again I am afraid, you will need to look very carefully to be able to see it and the tugs are almost invisible. On our way home, we diverted to take in Looe and suddenly there was this wonderful light on the sea. Yesterday we had to cross the moor to Tavistock. That makes it sound like a penance which was far from the truth. For weeks we have suffered from cold winds from the north and east which have given us the clear cold weather described above. During Wednesday night things began to change: a low pressure system which had been held at bay in the north Atlantic by a ridge of high pressure for ages edged closer and closer. By morning the wind was from the south and the thermometer reading was up by five degrees but we could see, building up in the west, the heavy grey clouds that presage rain. Thus we drove across Dartmoor with the light constantly changing as the sun peered through between the clouds to light this hill or that tor and, before there was time to stop the car let alone take a picture, that streak of brightness would die away and everything would become dull and rather dreary for a few minutes. The moor has a strange look this year, almost as if it were late summer or early autumn with all the green gone and the grasses, sedges, reeds, bracken and so on various shades of yellow and brown – the only greens in sight being that of the firs and the gorse. Marcia shopping in The Happy Apple in Totnes. Quiz for the week. What animal is this? Answer next week. The blog dog this week is Lady. Well, she is, isn’t she? Wednesday’s forecast was cold but sunny and, for once, was accurate. As you know, Marcia is in the process of tidying up book 24 and, not surprisingly, there were a few bits and pieces that she needed to check ‘on location’. So, notwithstanding a thermometer that was suggesting it was the coldest April day in living memory (which may turn out to be the literal truth) we set out to brave conditions on the high moor. After a morning spent sorting booky things we ended up in The Dandelion, attached to The Moorland Hotel near Haytor. This is where some rather critical moments in book 24 take place but more important than that, it was warm. And the food was, as always, superb. Whilst in The Dandelion, there arrived a delightful Cairn by the name of Morris complete with a green ball in his mouth, one man and two women. I could not resist him and it is with great sadness that I have to admit that none of the pictures I took worked: light levels were low and Morris is a busy person with the result that none are sharp enough. I really should have asked to take his portrait outside but it was still very cold and I decided that I would take quite a fair number and that there would be at least one that worked. Wrong! It transpired that one of Morris’ party was a Marcia Willett reader and they had a lovely chat before we left. The women were sisters and, like Marcia, came from Somerset. In a desultory sort of way Marcia and I were talking about what I would write for today’s blog when it was suggested that it should include some photographs of ‘Ladies who Lunch’. My idea or Marcia’s? Not sure but probably hers – almost certainly hers. So it was we decided that, on the way home, I would try and get some suitable pictures of ladies lunching – results below. On a more serious note: you will see above cattle and sheep gathered round feeders at a time of the year when you would expect them to be scattered around the fields tucking into the new spring grass. Not this year. This is very bad news for some farmers who are seeing all their profits being used to keep stock alive and healthy in this awful weather. It could well be bad news for the rest of us: food prices should increase to compensate our food producers for the additional costs incurred by the weather thus spreading the load. The strong hold that the supermarkets has on food buying means that the odds are we shall see prices go up a bit but not enough and some farmers will go to the wall – and that is bad for everyone. On the way home we came across a couple of young chaps doing the most incredible things on skateboards. The following pictures will give you some idea of how incredible. Lastly, our blog dog this week is Ted.